Did you have a look at my previous post on making pickled cherry blossoms? My first attempt came out great! I nibbled on a few of the Somei Yoshino petals and they were beyond delicious--slightly chewy and tart, these aromatic, pale pink slivers made me crave for more. They are still in the drying process and I fully intend to use them properly. 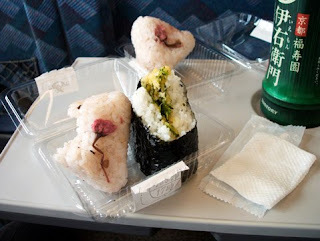 These are available at the Shinagawa Shinkansen Station in Tokyo. Personally, I'll make one with an umeboshi in the center, and salt the rice with left over Ume-sakura vinegar with 1 or 2 of my precious blooms pressed on the outside (as shown in the pic above). How about simple cold noodles or tsukemen? 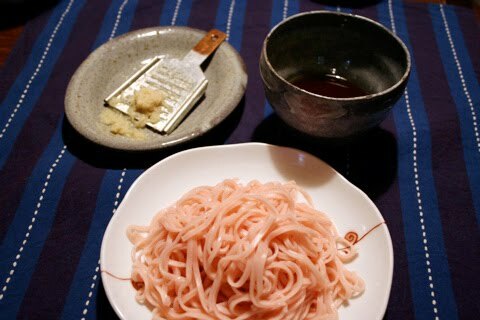 The author suggested mixing a little grated ginger with tsuyu (dipping sauce) before dipping. Yummy! Cherry-blossom ice cream, from an old-school kissaten near Meguro-station that serves average quality vacuum-pot coffee and various sandwich-like nibbles. 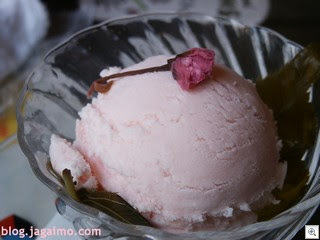 The ice cream appears to be a lightly-flavored cherry ice cream served on a cherry leaf and topped with shiozuke, or salt-pickled cherry blossom. I can only imagine that the salt brings out an added depth to the creamy plummy goodness that is sakura ice-cream. 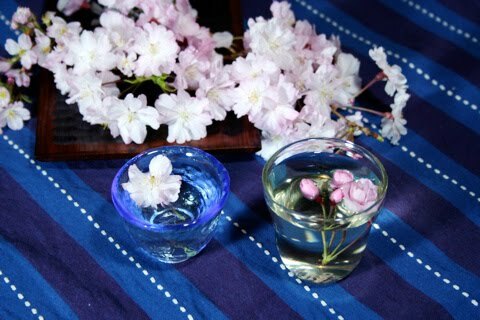 Top it off with sakurayu (pickled sakura in hot water) or accent in a nice refreshing cup of sake ala Hanamizake (花見酒)... Mmm. 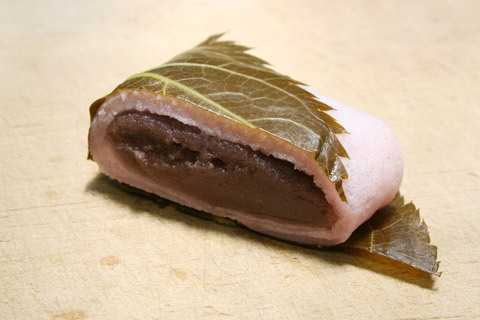 Kanto and Kansai styles are very different in Japanese cuisine and culture; naturally that extends to mochi as well. Kyotofoodie's comprehensive comparisons of the 2 versions can be accessed below. 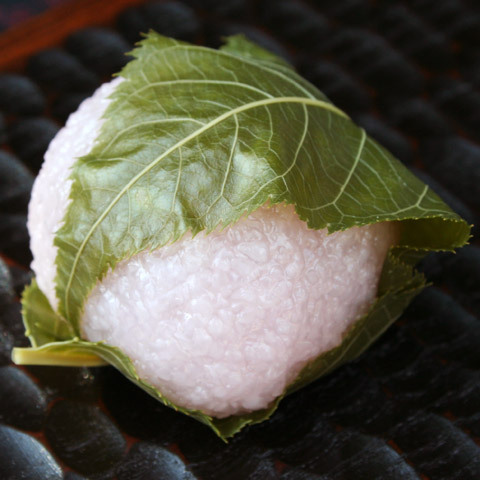 The gist in a nutshell: The Kansai mochi is softer and more chewy than the Kanto version. Did I inspire you to make your own pickled cherry blossoms? Hurry up before they fall off! If you don't get the buds, get your hands on the petals at least! I'm organizing a sake and sakura party soon, yay!